Ready To Improve Your Learning Design Skills? Modern learners are consuming content in new ways than they were five years ago. As a result, learning designers need to understand how to create engaging eLearning with modern learners in mind. Think about it. We now have smartphones that are more powerful than computers were ten years ago. We have modern web technologies that enable engaging content experiences. And, we have a global audience we may now be responsible for training. 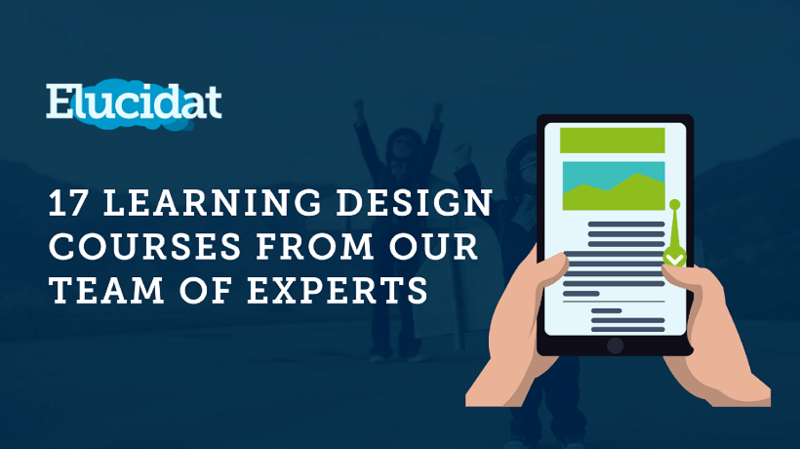 With this in mind, the Elucidat team has put together a free course covering 17 of the hottest learning design topics in 2017. They have bottled up tips, advice, and inspirational demos from a network of experienced learning consultants. For example, you will learn best practice mobile design strategies used by top performing learning teams. And you’ll discover how to use surveys to ask learners questions and personalize content to meet their needs. This free learning design course is delivered online as a set of bite-sized inspirational modules. You can consume it on the go, on any device, whenever you want (we’ve built it in Elucidat, of course). Training and Content Providers who want to design high-quality, industry leading content that can give them a competitive advantage. Learning and Development Teams who want to improve the learning content they deliver to employees. Professional Bodies and Education Teams who are under pressure to create more engaging, high-quality content that their members and students want to consume. How to bring storytelling into your learning. Why you need to use rewards to incentivize learners. Dos and don’ts for scrolling page designs. How to write compelling content for your courses. Top tips for mobile learning design. How to design a good ending to your course. How to use Layout Designer to create engaging eLearning. Best practices and tips on using audio in your learning. 3 ways to use timeline interaction (examples and demos included). How to use animation to lift your content. How to use social polls to enhance your learning. Best practices for writing content for a global audience. How to really QA your project. Tips on how to use Elucidat as a survey tool. How to use Styles to brand your eLearning experience. How and why you need to simplify your navigation. How to add images to text fields inside your course. Are you ready to improve your learning design skills? Get the free course from Elucidat today!